The first choice for playing folk tunes, the mandolin is an extremely popular instrument. In sessions the bright, clear sound cuts through, but it's versatile enough for accompaniment and virtuoso bluegrass playing. Same tuning as the violin, GDAE. Scale length 36cm. We can customise the fingerboard width and profile, as well as the scale length, at no extra cost. This mandolin has a bright and clear sound, but also a sweet and full tone because of the choice of woods and quality workmanship. 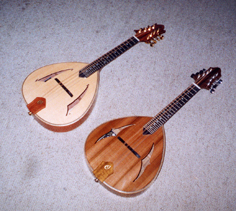 Our most popular instrument, the Teardrop mandolin has a remarkable volume for such as small body. The tone is bright and clear, with a cutting edge that makes it ideal for sessions. We use Gotoh machines, a simple tailpiece, rosewood fingerboards and rosewood or sycamore bindings to help keep the cost down. Same great sound as the standard Teardrop with a more exotic appearance. We use a wide range of figured hardwoods for the back and sides, sometimes with a three-piece back to show off the beauty of the wood. The machines are Schaller and the fingerboard ebony. The bindings are chosen to complement the woods used. A further development of the teardrop design, this instrument has a deeper body, giving more bass response, but still with that distinctive cut. With a deeper body similar to the Nova, the Xeros comes with a choice of 'f' holes. The Xeros I is on the left, and Xeros II on the right. The guitar shape of the Nimbus means tremendous volume and tone. This mandolin has a high gloss finish and is also available with a cutaway. A chunky, powerful sound that really does the business.